This homemade 4th of July cake is really easy to put together and looks beautiful. 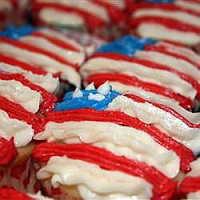 Moist and delicious, a wonderful way to celebrate Independence Day. Offering many more July 4th dessert recipes below. There's nothing more patriotic than a homemade flag cake from scratch and I have several photos to give you ideas on how to make a 4th of July cake. The actual cake can be white, yellow, or your favorite flavor - it's just putting on the decorations that makes it look festive. Following is my white almond cake recipe that is downright the best and it has been used for wedding cakes too. For the cake on the above, bake the cake in a 9x13 inch pan. Use the french vanilla frosting below and frost the cake. Buy fresh raspberries and blueberries and arrange them like you see in the photo. Fall in love all over again with this French Vanilla Cake. Incredibly moist and tender, the taste is perfect - pure vanilla. Makes a great 4th of July cake too. A tip for this french vanilla cake recipe: If the butter is not completely soft, you will have to beat it for several minutes to get the light and fluffy texture. PREHEAT oven to 350 degrees. Butter three 9 inch cake pans and dust the inside with flour and tap out excess. Line the bottom of the pans with wax or parchment paper. Put the cake pans on a baking sheet lined with parchment paper or a silicone mat. Sift the dry ingredients together and set aside. Beat the butter for 3 minutes until light and fluffy. Add the sugar and beat another 3 minutes. Add the eggs, one at a time, and beat thoroughly after each addition. Start adding the flour mixture one cup at a time, and alternate with the milk; ending with the flour mixture. Add the vanilla, mix well and pour into prepared cake pans. Bake for 25-30 minutes or when a knife inserted in the center of the cake comes out clean. Transfer to a rack and cool for 5 minutes, then run a knife around the sides of the cakes, unmold them and peel off the paper liners. Place the softened butter in a mixing bowl and beat with 1/2 of the powdered sugar. Add the vanilla and milk and mix well. Add another cup of powdered sugar 1 cup at a time until you reach the desired consistency to spread; you may not need all of the sugar specified. Beat until light and fluffy. You will need red and blue food coloring or gel if you want to do cupcakes. Just pipe it like you see in the photo above. Not just a 4th of July cake, I also have a 4th of July cookie. This recipe and photo courtesy of Pillsbury.com - one of my favorites. In ungreased 12-inch pizza pan, break up cookie dough. With floured fingers, press dough evenly in bottom of pan to form crust.